Recently Pecos Bill’s tall tale Inn converted from a hamburgers and pork sandwiches menu to more of a Tex-Mex menu. With that change, nearby Tortuga Tavern changed its menu to a BBQ inspired menu. Barbecued Pork Sandwich on Texas Toast with Coleslaw and Baked Beans. Barbecued Chicken Sandwich on Texas Toast with Coleslaw and Baked Beans. 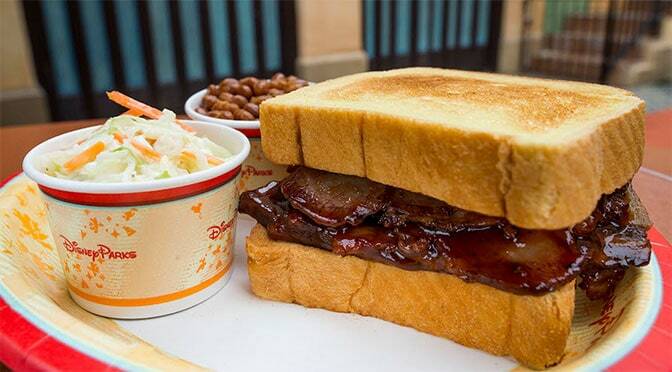 Barbecued Beef Brisket Sandwich on Texas Toast with Coleslaw and Baked Beans. Roasted Corn and Vegetable Salad, topped with Red Wine Vinaigrette. Roasted Corn and Vegetable Salad, with Barbecued Beef Brisket, topped with Red Wine Vinaigrette. Roasted Corn and Vegetable Salad, with Barbecued Chicken, topped with Red Wine Vinaigrette. includes Grapes, Carrot Sticks and choice of small Lowfat Milk or small Dasani® Water. Small Nesquick® Chocolate Milk, Applesauce, or Cookie substituted upon request.